After a good weekend of practice with Alex Ross and Connor Curry, Sasha plays today on Court 4 at Weeks Park Tennis Center–Not before Noon. Today Sasha and I are meeting in Oaklahoma City. He is coming from New York and I from my home in Palm Springs. From there we drive to Wichita Falls, TX. We chose to fly into Oklahoma City because it’s midway between Wichita Falls, TX (a little over a hundred miles) and Tulsa, Oaklahoma (a little over fifty miles) our next tournament. Easier to drive these distances than to fly. These are the only 2 tournaments on this trip we are able to do this with. This is a 64 draw tournament with a 64 draw qualifying tournament. The qualifying tournament is Saturday and Sunday. Those players who reach the quarter finals get entry into the Main Draw which begins on Monday. Sasha has a wild card into the Main Draw of this event so we will use Saturday and Sunday as practice days. 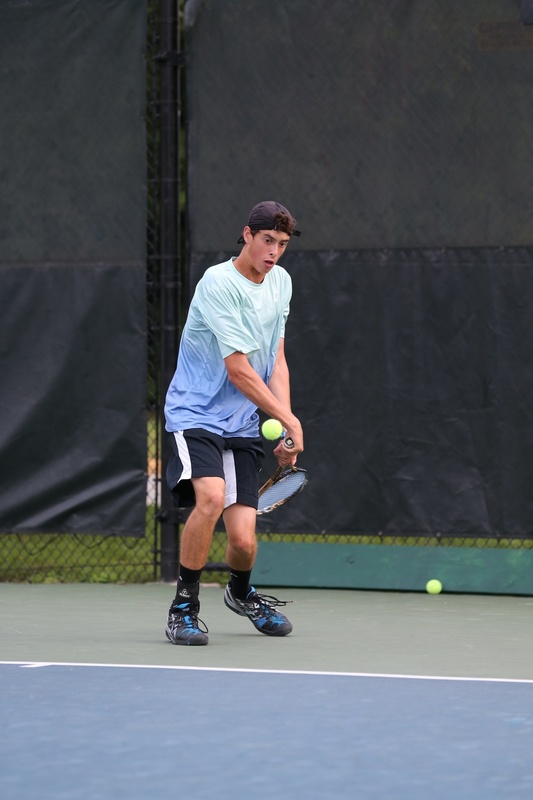 The process of playing ITFs is different from USTA tournaments. There is an entry process with deadlines for withdrawl etc., but you really don’t know who is going to be in the draw until the night before the tournament begins. There is a sign in process (Friday from 3pm to 6pm) for the Qualifying Tournament. Later on Friday night the draw is published along with a schedule of play. On Sunday from 3pm to 6pm there is a sign in for the Main Draw. Again later Sunday night, the draw is published along with the schedule of play. This process is repeated yet again on Monday for doubles. So the bottom line is you really don’t know who will be in your draw until the night before you have to play. We will post links to the draw here on the Blog for each tournament. To give you a sense of life on the road, we will make comments here on the blog in addition to posting some pictures. Wecome to the TennisAdvisor.com Blog. I will be posting updates on this Blog right through the end of the year. Earlier in 2013 Sasha decided he wanted to take his tennis to the next level and see how good he can be. The next logical step in competition is the International Tennis Federation (ITF) Junior Tour. At this level a player is no longer competing just with other players from the US, but with all 18 and under juniors in the world. As a note for those a bit less familiar with junior tennis, the Grand Slam Junior Events are all Grade A (top level) ITF tournaments. There are five other levels ranging from 5 (the lowest level junior ITF) to 1 (the highest level junior ITF below the Grand Slams). In support of his tournament play, Sasha practices, when at home, at the John McEnroe Tennis Academy on Randall’s Island in New York. I serve as Sasha’s primary coach and Lawrence Kleger coordinates his practice and shares the coaching responsibilities with me. At JMTA, Sasha gets a lot of help from Peter Fleming and from John McEnroe. Sasha has worked for many years with Claudio Eulau, who provided the foundation for his tennis strokes and playing style. Under his guidance, Sasha adopted the Argentinian all court style of play, with an added emphasis on power. Claudio remains a trusted mentor and advisor. Sasha also trains when at home at Fitness by Bobby with Bobby Filipov acting as his physical trainer. As a result of the many routines and programs Bobby has designed, Sasha has a strong physical and mental presence on the court. Sasha’s mother has supported him throughout his tennis journey. She is a teacher and also a trusted advisor (in addition to just “Mom”). People ask what my role in Sasha’s journey is. I keep everything on track. I develop Sasha’s schedule, both his practice and tournament schedule. We travel together and I manage the logistics. That means everything from where we stay to tournament issues to raquest stringing. I spend some time at with him at the JMTA and much time on the practice court when we are traveling. We strategize before matches, analyze after matches, and tweak things as needed as we go along. Sasha continues his education via Laurel Springs’ distance learning program. He is a top student taking four advanced placement courses this semester and maintaining at 4.1 weighted GPA. In addition to English, Sasha speaks fluent Russian and Spanish. You are currently browsing the TennisAdvisor's Blog blog archives for September, 2013.